The Aggies received their 3rd commit in as many days this morning. 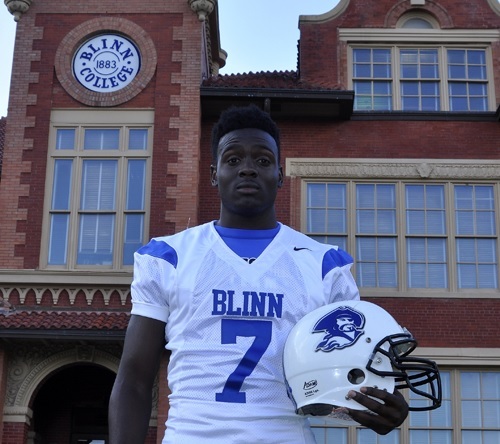 Darrell Jackson out of Blinn College committed and is eligible for this upcoming season. Jackson is a 6’5” 225lbs defensive end that redshirted last season. As a result, his enrollment will count against the 2014 recruiting year and he will have four years to play four. At Houston Madison high school and during his redshirt year, Jackson played safety. But during his redshirt year at Blinn Jackson, he went from 195lbs. to 225lbs. That kind of weight puts him in the ideal starting range for a weakside defensive end. And with Larry Jackson’s strength and conditioning program, he could most likely get that up another 20lbs-30lbs. Defensive coordinator Mark Snyder has to be thrilled with the prospect of grooming a former safety with a 4.58 second 40-yard dash and a 38” vertical into a pass rusher. If the experiment pays off, it could be a steal for the coaching staff. Frank Iheanacho is a huge receiving target who has drawn comparisons to Mike Evans. Both players are over 6’5” and at least 220lbs. Also, both players were basketball stars that didn’t seriously start playing football until their senior year in high school. Consequently, they both figure to have their best football days ahead of them. The main difference is that Evans was only a 3 star prospect that received minimal attention entering college while Iheanacho has garnered 4-star status and is considered one of the top 100 prospects in the nation for 2014. He held offers from LSU, Oregon, Florida St, and Michigan St among others. But during the Army Bowl January 4, 2014 he announced his commitment to A&M. The city of Nederland declared yesterday to be DeShawn Washington Day. If you haven’t already, follow him on twitter @OMG_Waterfront. DeShawn Washington is the state’s top defensive tackle and the 11th best prospect in Texas according to 247sports. He is a consensus 4-star recruit and held offers from Texas, Oklahoma, Baylor, and was getting heavily courted by this powerhouse. His offer list would be much more extensive if he had not shut down his recruitment early and committed to the Aggies on March 2, 2013. Kyle Allen comes in as A&M’s highest ranking quarterback recruit since Reggie McNeal. However, the 5-star recruit may be the top pro-style quarterback A&M has ever landed. With offers from Alabama, UCLA, Arizona, Notre Dame, and Ohio St, Kyle Allen shocked the nation with his decision to leave the PAC-12 area and join the Aggies in the SEC.